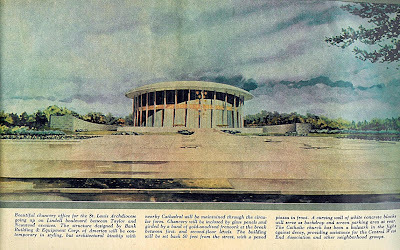 A “Special Progress Section” was included in the May 7, 1961 edition of the St. Louis Post-Dispatch. These 3 examples shown boasted about the progress on Lindell Boulevard in the Central West End, like the Optimist building. 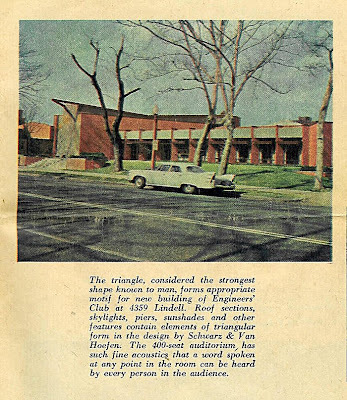 They also touted the new building for the Engineer’s Club, which is by the same architecture firm as the Optimist building, Schwarz & Van Hoefen. The Catholic Church has been a bulwark in the fight against decay, providing assistance for the Central West End Association and other neighborhood groups. Ironically, the same Catholic Church that championed progress on this block of Lindell now wants to tear down one of those progressive buildings they helped usher in. Learn more about the push to save the San Luis here. It was a sweet justification to find this “Special Progress Section,” because it supports what I’ve been trying to say about the Central West End and Lindell Boulevard, in particular: all chapters of its story are important and vital. And it is highly irresponsible and short- sighted to begin destroying buildings that were considered the desirable solution to older buildings they felt needed to be destroyed. The cycle has got to stop! We can no longer (literally) afford to squander our history and resources. There must be real understanding of past and present, and a practical plan and vision for the future based on the realities and aspirations of the entire community. You can see how these 3 buildings look today by clicking here. 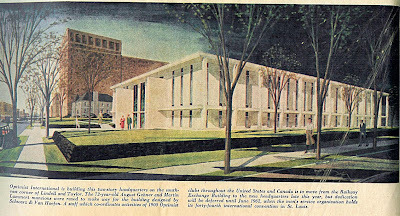 This entry was posted in architecture, city of st. louis, mid-century modern, modern architecture, st. louis history and tagged architecture, central west end, lindell boulevard, mid-century modern, st. louis city by Toby Weiss. Bookmark the permalink. Love how the chancery office conveniently omits the New Cathedral. Were they originally planning to put it in a field? ?